This range of deposit lockers from Chubb Safes is designed to offer maximum protection against all forms of attack including unauthorised entry, fire and flooding. The lockers are the ideal solution to store a multitude of valuable items to ensure ultimate peace of mind. The high quality deposit safes offer a dual control locking mechanism system ideal for high security environments. This means that each individual locker is fitter with 2 keyholes; a key belonging to the renter and the second to the custodian. Therefore the custodian has to be present when any safe deposit locker is accessed ensuring maximum security. All Chubb Deposit Lockers are supplied with inner containers as standard. Each of these are also provided with a hasp and staple allowing a renter to install an additional padlock if they desire. 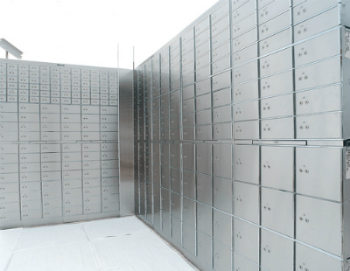 Additionally Chubb Deposit Lockers are numbered from the top left, horizontally to the bottom left as standard ensuring ultimate organisation. Other numbering systems are also available for those who wish to adapt this feature. If you are interested in a Chubb Safe Deposit Locker or any of our Hotel Lockers and Safes call Thornhill Security for more information on 0117 9674994. Our security experts are always on hand to help you with all enquiries, purchases and a full safe installation service.